MOORESVILLE, N.C. (September 5, 2018) – Richard Petty Motorsports (RPM) development driver Thad Moffitt will make his Team Chevy racing debut start this Friday night at the short track in Clermont, Indiana, just miles from the Indianapolis Motor Speedway. Moffitt will compete in the ARCA Racing Series Shore Lunch 200 and is hoping to better his 11th-place finish last year. He’s also wanting to collect another Top-10 after finishing 10th at the Toledo Speedway earlier this year in ARCA competition. 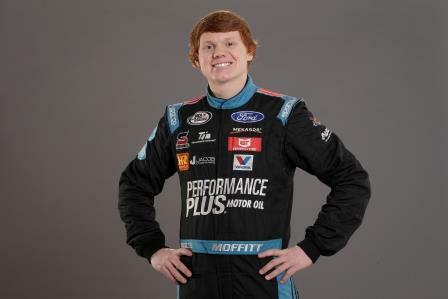 Moffitt, 17, returns to Indiana with a new car for his eighth ARCA Racing Series start. Moffitt will race the No. 46 Performance Plus Motor Oil Chevrolet after his team purchased Chevrolet cars and assets from Mason Mitchell Motorsports over the summer. Moffitt is ready to race the new cars this weekend after a successful test. In preparation for all the changes, the team tested in Indy at the track they will return to on Friday for the one-day show. The No. 46 Chevrolet will run with primary sponsor Performance Plus Motor Oil on the hood and sides and also with associate sponsors Transportation Impact and Hostetler Ranch. Moffitt, the 2016 Southeast Limited Late Model Champion from Trinity, North Carolina, is the son of Brian and Rebecca Petty-Moffitt. He started racing a go-kart and a quarter midget before moving to a Limited Late Model and now a Late Model. He competes part-time on the ARCA Racing Series. A high school student, Moffitt grew up going to the track with his grandfather, “The King” Richard Petty, and also watching his uncle, Kyle Petty, race. Friday’s schedule includes practice, qualifying and the race. The Shore Lunch 200 is scheduled for 9:00 p.m. ET and will be televised live nationally on MAV TV. Performance Plus is a premium brand of lubricants that provides superior quality and unmatched performance at a competitive price. Performance Plus products use conventionally refined oils and proprietary twice-refined oils, blended with industry-leading additives, to meet and exceed industry certifications, licenses, approvals and OEM warranty requirements. With more than 30 years of innovation, research and testing, Performance Plus formulations are relied on by some of the largest commercial fleets and U.S. military combat vehicles, as well as race teams at events across North America. Visit PerformancePlusOils.com. A performance and marketing driven company, Richard Petty Motorsports (RPM), co-owned by NASCAR Hall of Famer Richard Petty and successful business entrepreneur Andrew Murstein, is one of the most recognized brands in all of motorsports. RPM is the winningest team in NASCAR Cup history with 273 wins and has business partnerships with national and global leaders. Today the race operation fields the famed No. 43 in the Monster Energy NASCAR Cup Series with driver Darrell “Bubba” Wallace, Jr. The team is headquartered in Welcome, North Carolina, and is supported by primary partners Click n’ Close, STP, Smithfield Foods, United States Air Force and World Wide Technology. Established in 2009, Empire Racing Group (ERG) is a development team that strives to identify young racing talent and assist them in the advancement of their careers. While ERG originally focused on the ARCA Racing Series with driver Sean Corr (team owner/driver), the team has since expanded its reach into other series, thanks in part to its alliance with Grumpy’s Performance, Inc. Under the expertise of crew chief Mike “Grumpy” Cheek, ERG now competes in various late model series as well as the NASCAR Camping World Truck Series (NCWTS). In 2016, ERG will be serving as the developmental team for Richard Petty Motorsports, providing young drivers with driver coaching, technical support, public relations and marketing needs. Drivers for the 2017 season include notable rising stars Thad Moffitt and Harrison Moffitt, as well as racing veteran Sean Corr.